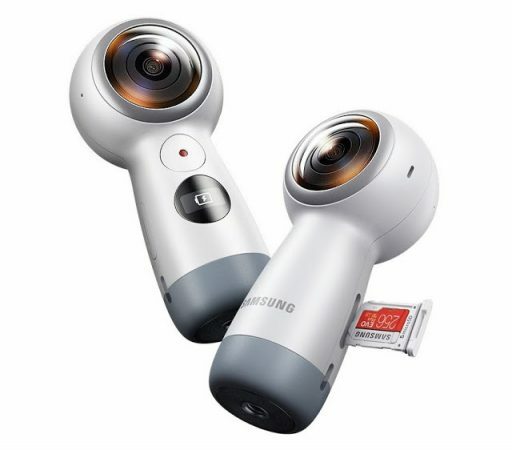 The 2017 Samsung Gear 360 uses a different version of ActionDirector desktop software. Here is where to download it. The 2017 Samsung Gear 360 (available here; first impressions here) is one of the hottest 360 cameras of 2017 because it appeared to be the equivalent of a 4K Theta (until the actual 4K Theta was announced). The 2017 Gear 360 can be stitched on the app or the desktop software, but if you stitch it on an iPhone, the video and photo resolution will be limited (in contrast, when stitched on a Samsung S6, there is no reduction in photo or video resolution). The manual is cryptic about where to download the desktop software, saying only that it’s on samsung.com. But after some digging, I’ve found the manual and the desktop software (Gear 360 ActionDirector version 2). Here is the download link for the desktop software. Here is the user guide in English. Here is the safety guide. Note: ActionDirector 2 requires Windows. For Mac, there is a separate software for stitching but I haven’t found it yet. Thx, that helped me A LOT! I tried the old version with my new 2017 gear. And there is no product key in the box… The new version can be activated with the serial of the gear itself. Stupid Samsung. The serial just have 11 characters but the key is made by 28 characters. What should I do to complete the key. Please help me. Hi Fausto. IIRC, when it asks you for the key, click on the drop down box to choose option to enter a serial number. Getting and error during install: The process cannot continue because the (Visual C++ Redistributable Packages for Visual Studio 2013 (x64)) install was unsuccessful. I could only find the 2015 Visual C++ download but that did not fix it. I’ve downloaded at least a dozen versions of ActionDirector install and I get the same error. I had the same error and to fix the issue I had to uninstall Visual Studio 2013 (x64) and (x86) first. Only after you can install the software so they will be no more conflict. It work for me, hope it will be the same for you. This also worked for me Win10 64 bit. Uninstalled all 2013 visual c++ installs then it works just fine. Hi, same error for me. I did uninstall Visual Studio 2013 (x64) , but this error continued. I could successfuly installed Gear 360 Action Director 2.
hi! yes it works with both! However, when I click to the icon “gear 360”. It disappears , please help me! HELP! Action director just doesn’t install on my machine. brand new Windows 10 HP ZBook and it just wont accept Visual Studio C++ additions that this needs. worked ok on my last Windows 8 machine. I’ve tried unistalling and re-installing Visual studio and am getting nowhere! Sorry to hear that! Wow i wonder what could be causing it… Can you try to post on facebook.com/groups/360camerasgroup to see if anyone knows the answer? I received a nice new Gear 360 2017 model today, and still not been able to use it. The first thing as I’m sure everyone is aware getting any info from the Samsung site is nigh on impossible, hence how I ended up here. The PC software ActionDirector2 installs, tells me to have the serial number at the ready, which I do, then it never asks for it. When I start it, it’s says can’t activate, send purchase info to Cyberlink, I mean WTF. I’ve had this camera since this afternoon, it’s now nearly midnight and I’ve still yet to get it to work with anything so far. Hi Brian. If you connect the camera via USB to your PC and start the software, the software should be activated automatically. Well my problem is that the camera is not stitching the pictures. As I import a picture It says stitchings unavailable or something like it. I don’t have a Samsung phone and unfortunately the application is not working on mine So I will be happy if I’m able to use the computer. Hi York. If you don’t have a compatible samsung or iphone, then you need to use the desktop app. DEALS: Get 25% off Mettle Skybox suite of 360 video editing tools!